We find ourselves regularly suggesting Gails Kitchen for any lunch date /after-work gathering – the emphasis is on great bread (obviously) and small dishes which are mainly vegetarian but with fantastic combinations of ingredients and flavours that don’t leave you missing the meat – every dish is delicious and you have to be quite strict to not order one of everything. The Haute List girls decided to go for an after work treat and left with giant food babies – so much so that we could barely fit the incredible dessert which was such a shame! So what did we eat??? Bear in mind that the menu is seasonal so these were my favourite on the day – If you start with the bread don’t make our rookie error and fill yourself up too much that you can only make a small dent in dessert! 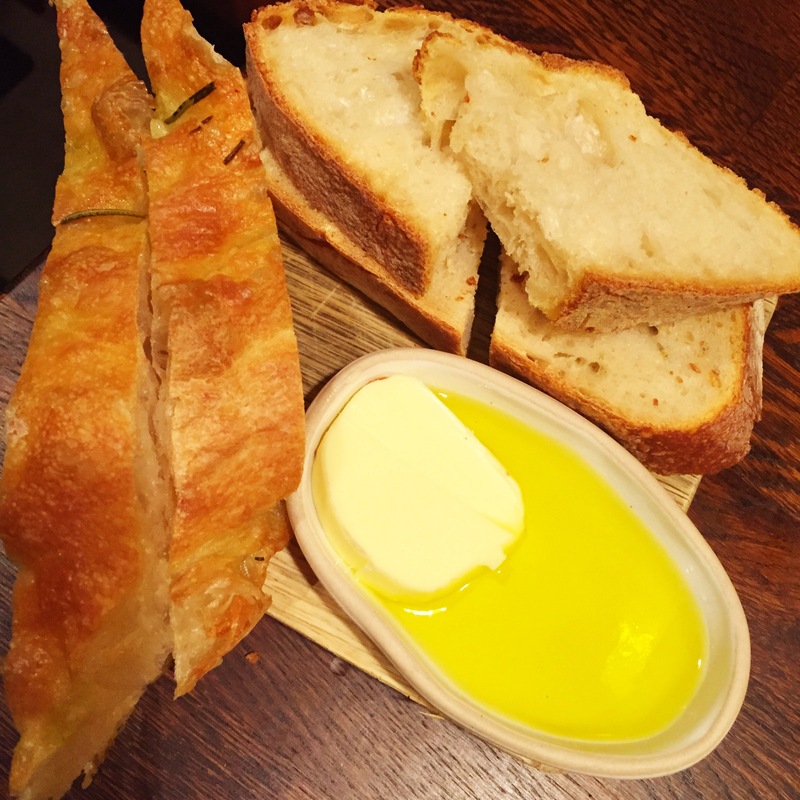 The bread is what Gails Bakery is known for though so it is absolutely delicious and comes served with oil and butter – so tempting to have half a loaf before you’ve started on anything else! The rest of the dishes tend to arrive as and when they’re ready as with all small-plate-focused establishments. 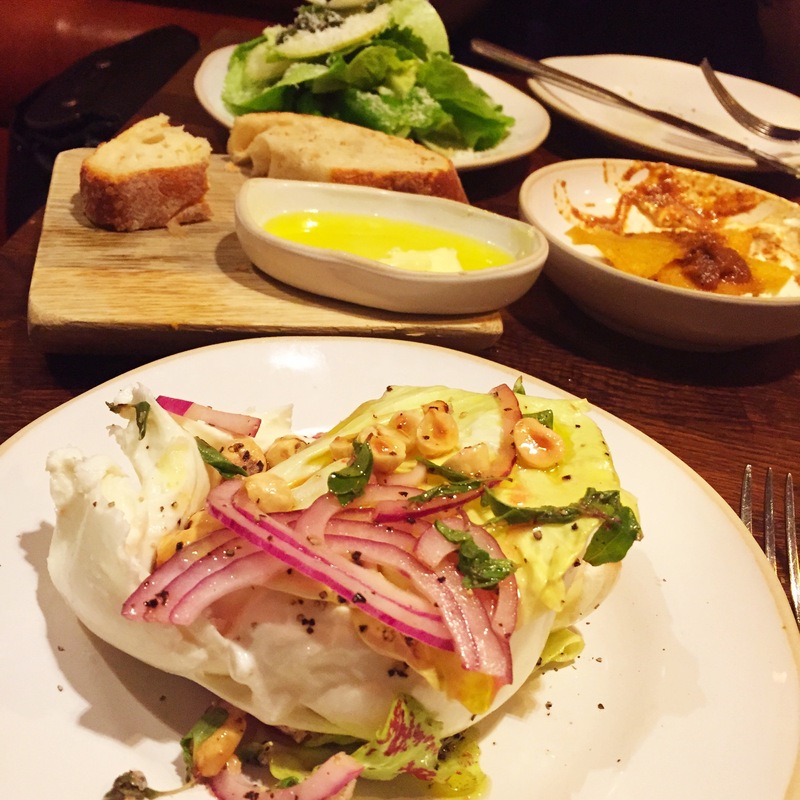 We ordered the burrata which comes with Castelfranco (like raddichio), grilled orange and hazelnuts. You basically want to swim in it it’s that good. We had blood oranges on our visit which were even more delicious. A must. We also opted for the round lettuce salad with celeriac, pear, pistachio and parmesan. Again – this isn’t just any salad. The flavours and the dressing is to die for and we now want to add shaved pear to every dish we make! 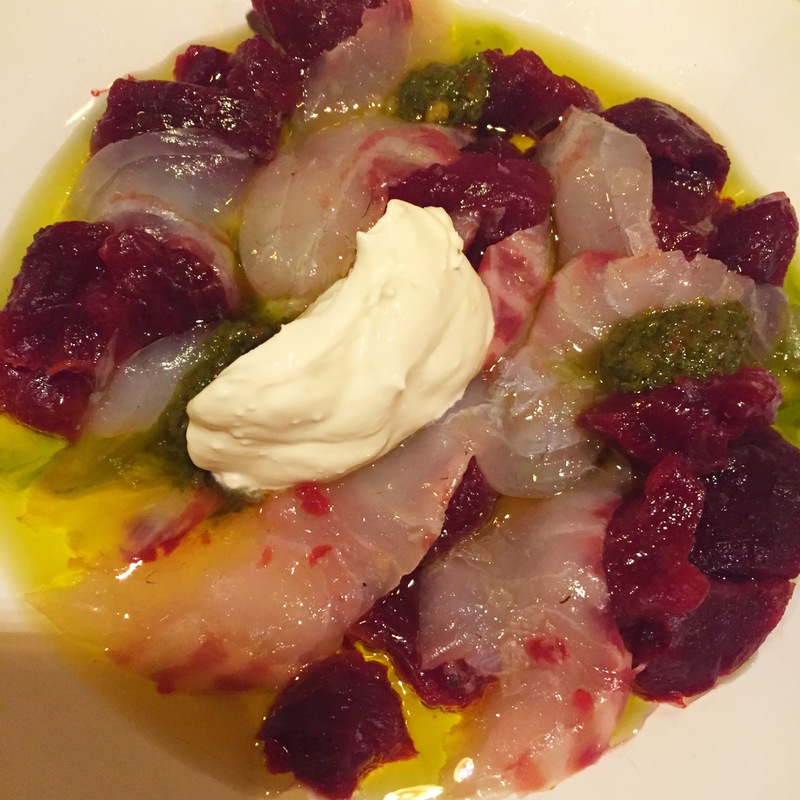 The sea bass carpaccio with roasted beetroot, creme fraiche and salsa verde was refreshing and light and we also got (more cheese) the Tunworth with the grilled sourdough – all divine. We had wanted the sticky chicken dish too but they had sold out at lunch – not surprising. 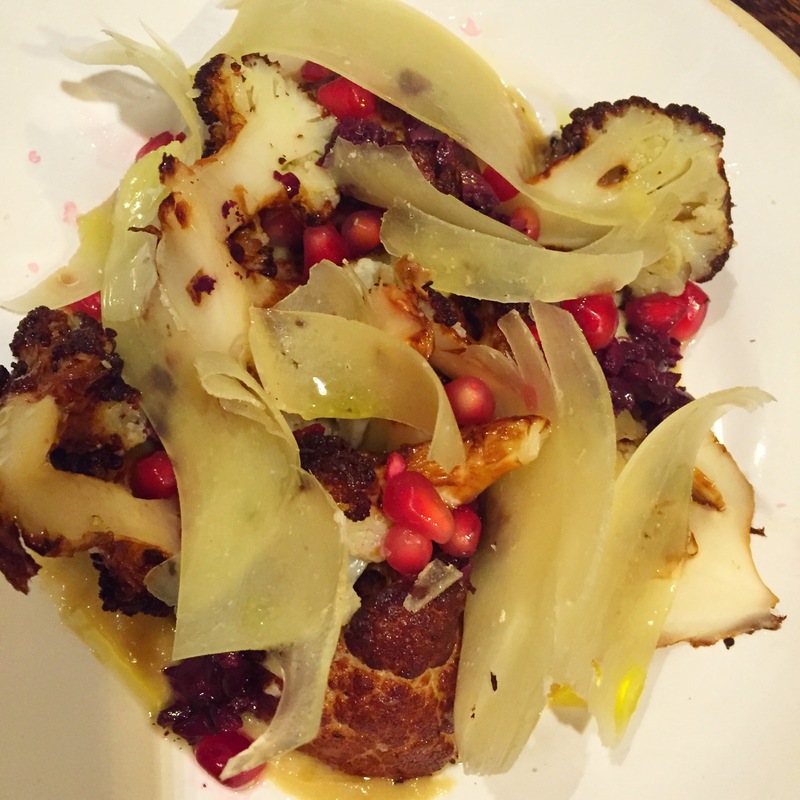 We replaced it with another veggie winner – grilled cauliflower with cheese and pomegranate. 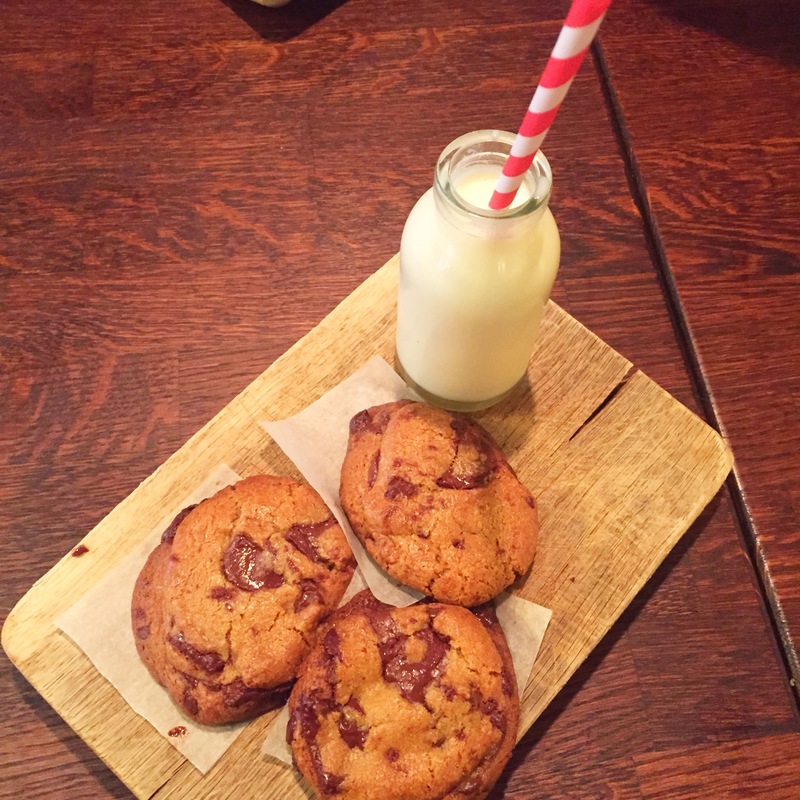 Finally we ordered – but couldn’t finish – the milk and chocolate chip cookies which come freshly baked and seriously gooey – the dream. It comes with a little glass bottle of milk with a stripy straw in a nice nostalgic nod to end the meal. Altogether a big thumbs up and somewhere we will continue to frequent pretty regularly. 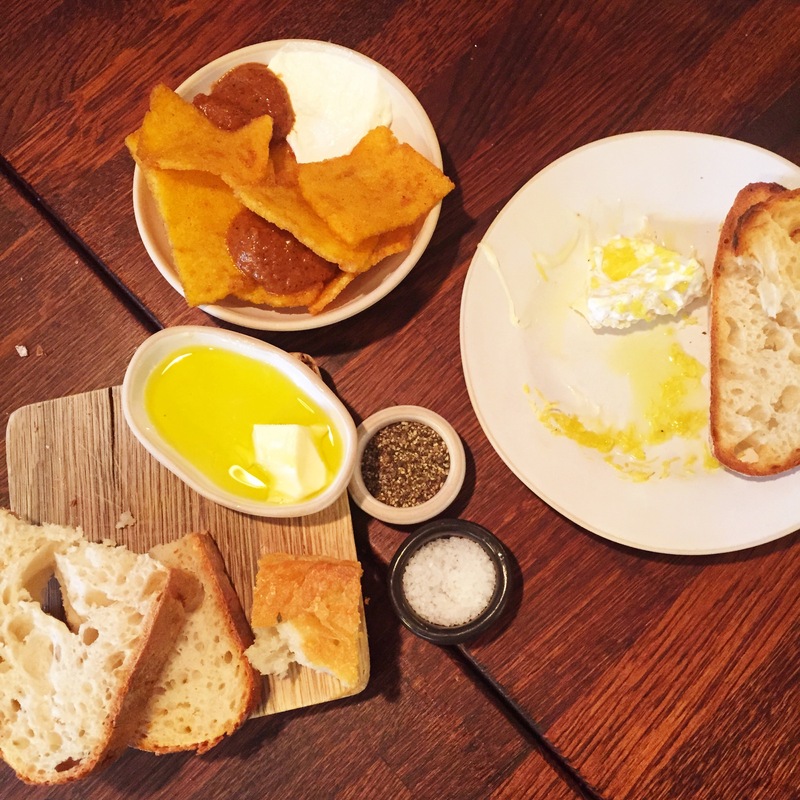 The lunch deal is particularly good – the bread, a drink and two small plates each for £19 and that tends to be plenty. We agree Jeremy. Have you tried their ‘kitchen’ restaurant yet? It’s divine.